Molly Burch plays at fabulous O’Leaver’s Tuesday, March 6. Photo by Helene Tchen Cardenas. 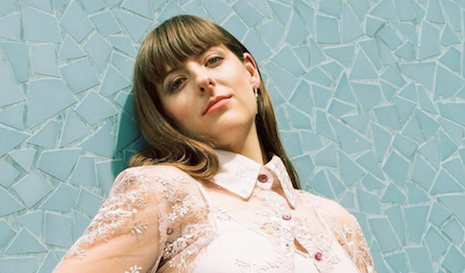 Molly Burch comes from a jazz vocal background, having studied the art at University of North Carolina in Asheville. But it wasn’t until she started writing songs that she began capturing the attention of a larger audience. Her debut LP, Please Be Mine (2017, Captured Tracks) is a lonely, winsome collection of heart-ache love songs sung with a voice that’s been compared to Patsy Cline and Billie Holiday. To me, the record sounds like Nancy Sinatra meets Mazzy Star, distinctly modern and dreamy with touches of sentimental, vintage arrangements. I caught up with Molly and asked her to take my Ten Questions survey, and she bashfully agreed. That’s tough so I will not answer it! Getting to know a small group of people really well. I love performing in LA because that is where I’m from and also New York because I get to see everyone at my label. Ugh, again, tough. I don’t want to offend any cities or towns! Pass! Sort of, but mostly because I live super cheaply. I also nanny to help pay bills along with other occasional side jobs. I love to set up shows and also plan and host parties…maybe a wedding planner? Lol, I don’t know. And I would hate any profession that involved a lot of public speaking. I’ve heard of the Runza. Molly Burch plays with Thick Paint and Sean Pratt & The Sweats Tuesday, March 6 at O’Leaver’s, 1322 S. Saddle Creek Rd. The show starts at 9 p.m., tickets are $8. For more information, go to liveatoleavers.com. Denver’s Esme Patterson (Grand Jury Records) gets the Hi-Fi House treatment tonight, starting with a 6 p.m. Q&A followed by an intimate performance by Patterson and her band. A “special guest” Omaha songwriter opens prior to her set. Entry is free for Hi-Fi House members, general public tickets are available on a first-come first-served basis for $25.